Level Field: Rain, rain, go away! The Group of Ministers on Commonwealth Games pulled up all agencies for having missed the June deadline for completion of all projects linked to the sporting extravaganza. The GoM, which met on Wednesday, has now set an August deadline. "The different agencies have been asked to complete all work and hand over all the venues to the Organising Committee by the first week of August for venue operation," said Union sports minister M.S. Gill, while briefing reporters after the meeting. Besides Union urban development minister Jaipal Reddy who chairs the GoM, Delhi chief minister Sheila Dikshit, Lieutenant-Governor Tejendra Khanna and Organising Committee chairman Suresh Kalmadi, also attended the meeting. Issues related to housekeeping and preparing accommodation for delegates and visitors was discussed. The GoM also pulled up the Delhi Development Authority (DDA) for the delay in completion of the accommodation venues. The DDA was to convert 3,179 of its upcoming flats in Vasant Kunj, in southwest Delhi, and Jasola in south Delhi to service apartments to accommodate the Games delegates. The agency was also rebuked for its shoddy work at the tennis stadium at the Yamuna Sports Complex. The terrace of the complex collapsed after Monday's downpour. 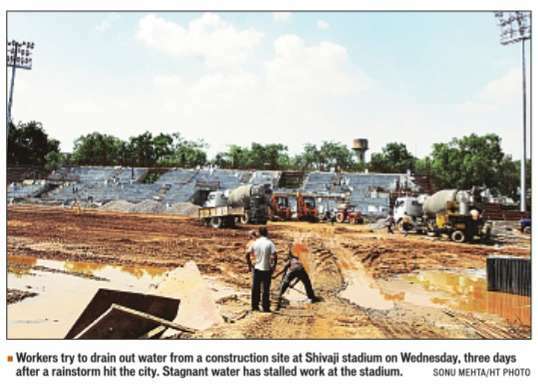 "The DDA has been asked to set up a crack team of engineers to monitor work at the site round the clock. There is no time left for any laxity," said an official who attended the meeting. The GoM also expressed concern over the rampant digging work going on in the Capital. "It is a issue of concern for us and we are monitoring it. The different agencies — MCD, NDMC , MTNL and DJB —have been asked to complete all digging work by August 10. We are aware of the problem and doing our best to finish work," said Delhi chief minister, Sheila Dikshit.